Our California and US road trip in late September 2017 was immense. We drove from San Francisco, down to San Diego and then across to Nevada and Arizona and I would recommend the adventure to everyone. The incredible variation of landscapes and cities surprised me and we had so many wonderful experiences. En route, I sought out the best gluten free food finds and have broken our trip down into handy city or area guides for your ease of reference. Note that as a coeliac I have focused on coeliac-friendly choices in these guides, but there were plenty more general gluten free choices too. Many eateries in the USA offer gluten free options, however they are often not coeliac safe. This was REALLY frustrating, but hopefully I have now done some of the legwork for you guys and you will have a much easier experience. This chapter is about gluten free San Francisco and gluten free Oakland, just across the bridge. 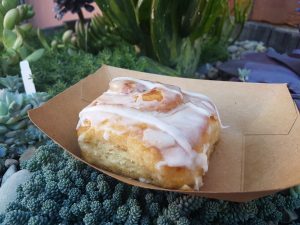 From gluten free cinnamon buns to truffled gluten free mac and cheese, San Francisco and Oakland have loads to offer the gluten free visitor. Of course, you will also get to see some epic sights along the way and enjoy these cool cities. 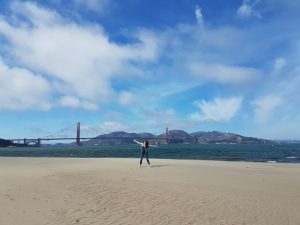 We spent a few days wandering around San Francisco, but even in that time I wasn’t able to get to all of the cities gluten free eateries. 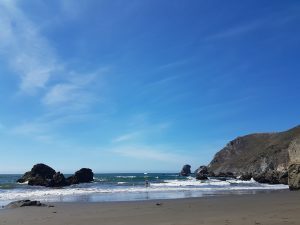 Below I have detailed my top gluten free San Francisco choices, plus I have noted other places I had wanted to visit. 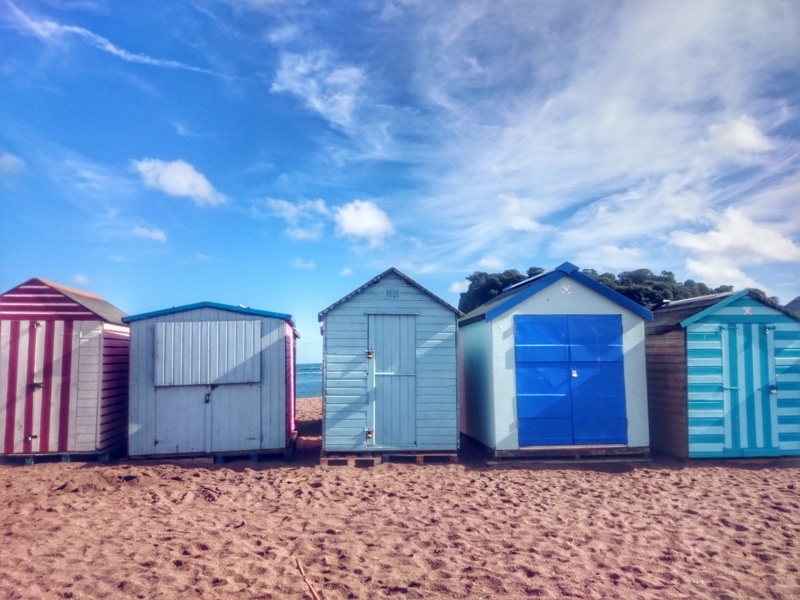 These might be worth checking out if you are nearby during your trip. San Francisco is a beautiful city with historical buildings, impressive views and crazy hills – I definitely recommend it as a destination. Try Zazie’s for a French-inspired mega American brunch. It is a very popular little French cafe with an airy terrace out the back. Pop your name down on the list and wait it out as it is worth it! They have gluten free bread, as well as pancakes. Note if you are coeliac you should avoid the pancakes and French toast as they have a small kitchen and staff advised me that they only have one surface for cooking those. The server was really helpful and recommended that the safest options for me would be the scrambled eggs (tonnnnes of amazing options with salmon, cheese, spinach, bacon, feta, tomatoes, ham) or eggs benedict (again about 10 varieties to choose between). I also asked to have the bread untoasted to avoid any potential cross-contamination there. The eggs Benedict come with fried potatoes, which are coeliac-safe. I had the Divorcee eggs Benedict on gluten free bread, which were fantastic (pic below). 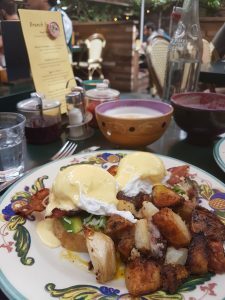 The dish comprised poached eggs, crispy bacon, avocado with lemon hollandaise and a side of golden brown fried potatoes with a couple of perfectly soft garlic cloves thrown in for good measure. The untoasted gluten free bread was really decent – thick chunks of soft white bread. All that lovely gluten free food was washed down with a bowl of foamy chai tea latte, this was one hell of a start to our first day in San Francisco. 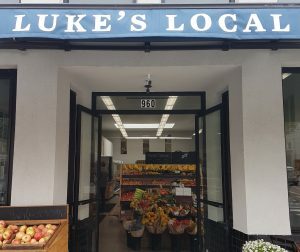 Across the road from Zazie’s is Luke’s Local, a grocery store. This is a good spot to grab some gluten free picnic supplies if you are headed to the Golden Gate Park for an afternoon walk. We found rustic gluten free baguettes, fresh gluten free blueberry muffins, gluten free tortilla chips and dips and much more. They also sold a few good-looking gluten free products for cooking at home, including pancake mix, proper corn tortillas and granolas. There are two Nourish locations in San Francisco and although I didn’t make it here myself, their menu looks very gluten free friendly with bread on offer and plenty of flexibility. The menu is plant-based with a healthy focus. 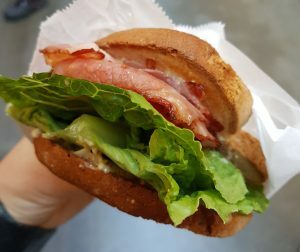 For a fully gluten free breakfast on the go, head to this 100% gluten free bakery in the ferry building (details below). 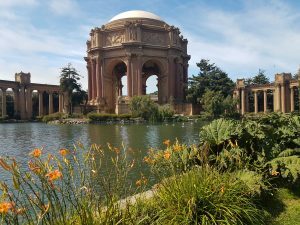 San Francisco has plenty of parks, beaches and open spaces, giving you the perfect opportunity for a gluten free picnic. There are a few places where you can grab gluten free supplies, from smaller neighbourhoor places like Luke’s Local (see above), to bigger stores like Whole Foods. We had our gluten free picnic in Golden Gate Park and you can find a Whole Foods opposite the east entrance of the park on the corner of Stanyan/Haight. 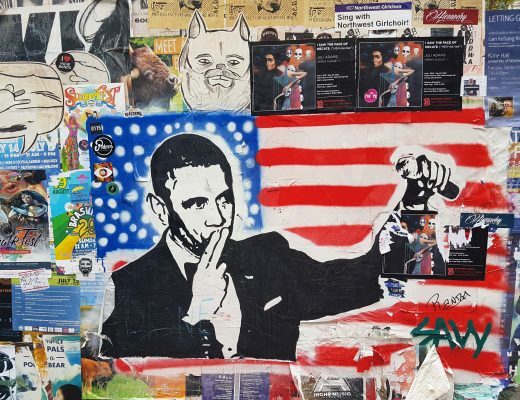 After you’ve finished your park visit, walk up Haight Street for cool vintage clothes and second hand book shops with a smattering of hippy San Francisco vibes. 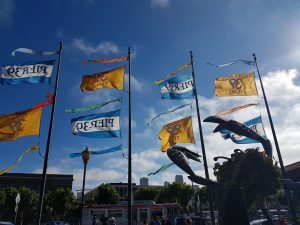 You get to experience a different side to the city round here, away from the tourist hoards down by Fisherman’s Wharf and Pier 39. Speaking of the tourist hub, the area around Fisherman’s Wharf didn’t seem that rich in gluten free options but Scoma’s had a few choices marked on their menu. Choices for gluten free diners included lobster bisque and black cod with potatoes, for example (it is a fish and seafood restaurant). I have been told they can also offer gluten free calamari, just ask for it to be cooked in a separate pan rather than the main fryer. 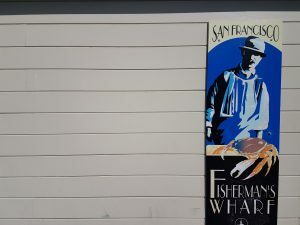 We came across a few gluten free options on Pier 39 – I had a look at menus and asked some questions but we didn’t eat round here are it was incredibly busy and we wanted to head for a less touristy lunch spot. Hard Rock Cafe at the start of the pier do gluten free burgers with buns and fries, grilled BBQ chicken wings and gluten free sandwiches with fries, ribs, steak and gluten free desserts. The gluten free desserts included a hot fudge brownie and ice cream sundaes. They also have a gluten free kids menu. Wipeout Bar & Grill have some gluten free options marked on their menu. 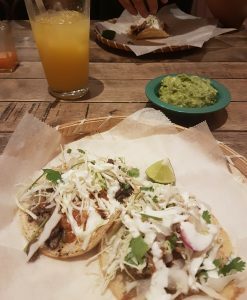 This included tacos, salads and their Big Wave Bowls (typically salmon/prawns/steak with veggies and coconut rice, these sounded pretty tasty). Pier Market also have gluten free options marked on the menu. Choices included lots of seafood options, including mussels, crab, ahi tuna with rice or potatoes and lobster, or steaks and salads. Biscoff looks very gluteny but they do fab smoothies with fruit and low fat yoghurt (we had one of these to cool us down – lovvvvely) and also sell gluten free cookies in individual sealed packets. The Ferry Building is full of foodie shops, stalls and bars and you could easily while away an hour or two with a drink here. Mariposa was the main draw here for me. Mariposa is a 100% gluten free bakery, which offers tasty hot gluten free sandwiches for lunch. They also do breakfasts, other savoury options and cakes and cinnamon buns. You could buy boxes of gluten free croissant and chocolate croissant when we visited. You can also preorder items to collect (their cinnamon buns are incredible). Farm Fresh to You is a fairly pricy grocery store in the building. They stock lots of gluten free bits and pieces though, from fancy pasta to cookies and crackers. 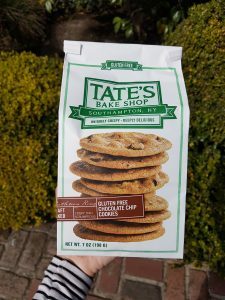 They have my faveeee Tate’s gluten free cookies here. Pica Pica is a fully gluten free Venezualan eatery focusing on arepas, which would be perfect for a quick sit down lunch. 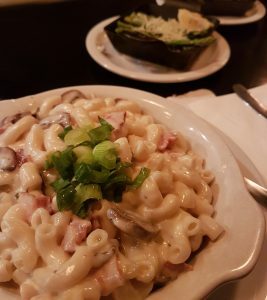 Mac n cheese is ordre du jour here and they have a tonne of mouth-watering varieties, including gluten free mac n cheese of course. Nearly all the varieties can be made gluten free, other than the meatball one, and they are safe for coeliacs. Please let them know if you are coeliac so that they can take extra precautions against cross-contamination (gloves, fresh tubs, etc). They also have some great sides, like short ribs, spiced corn on the cob and roasted broccolini. We ate at this Thai restaurant in the Mission district and staff were really helpful. There is no dedicated gluten free menu but they talked through the gluten free options with me and double-checked ingredients. 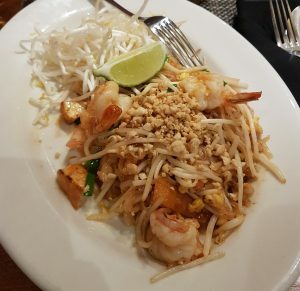 I had a goooood pad thai with fat, juicy prawns! There are a couple more Lers Ros restaurants across the city. 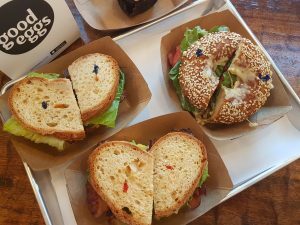 A fully gluten free eatery – sadly we didn’t have time to go here but it is worth having on your list! A restaurant offering gluten free fried chicken, which I read a few coeliac endorsements of. I haven’t tried it myself though so can’t attest to definitely being coeliac safe. We stayed in Oakland with friends and drove in San Francisco most days. 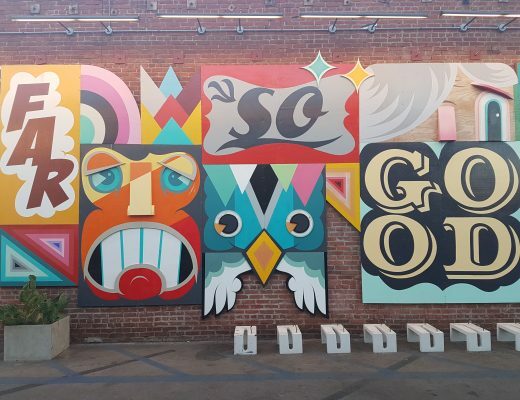 We spent some time mooching around the Oakland suburbs in Temescal though and it has a brilliant vibe. Lots of cool areas and cafes to be discovered. 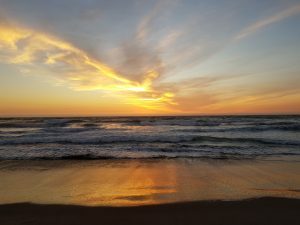 San Francisco may be the main draw in the Bay Area, but Oakland and the surrounding coastline is worth exploring too. 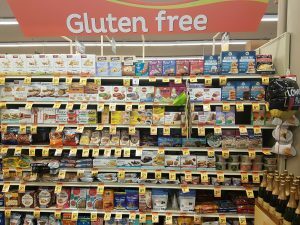 Safeway supermarket had a big gluten free selection and is a reliable place to stock up on gluten free supplies. Trader Joes and Wholefoods are also strong for gluten free food. A major draw for me though was Mariposa’s main bakery, which is based in Oakland. This fully gluten free bakery and cafe has an enourmous selection of gluten free food on offer. From incredible cinnamon buns and warm sandwiches, to ready-made lasagnes and ice-cream brownie treats, you really have to visit Mariposa! A Latin American restaurant in Temescal with a big reputation. They can offer gluten free tacos and will take extra care against cross-contamination if you let them know you are coeliac. We lucked out in stumbling across the El Sabrosito food truck, which is 100% gluten free by chance. 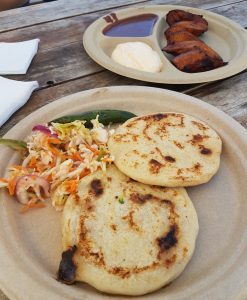 They serve up delicious El Salvadorian food like pupusas, fried plantain and other delights. They were dishing up delicious food at Temescal Brewing (no gluten free beers here unfortunately, but it is the perfect spot on a sunny day). 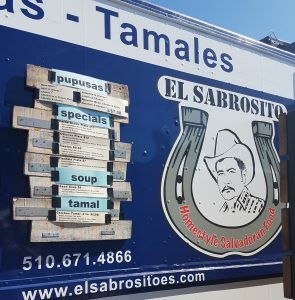 Check their website via the link above to find where in Oakland they are currently serving from. The smell coming from this place everyday is enticement enough. Sadly the homemade waffle cones aren’t gluten free BUT they do have other gluten free cones. 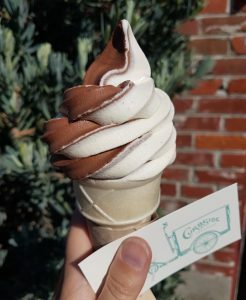 They offer softserve here (including a vegan variety), which is a good safe bet for coeliacs as there won’t be the cross-contamination risk of scooping from tube. Their vegan soft serve was amazing, I actually rated it more highly than the dairy (even though that flavour was fab too)! 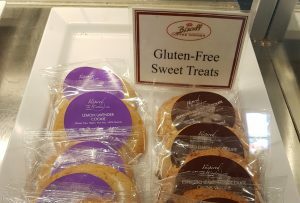 And while we are here, a quick note about gluten free in Oakland airport. Choices are quite limited, aside from a few snack bars, but I did manage to get some hot food. I tried Chillis Too and although they were clueless about gluten free on the takeaway side, the front of house staff in the restaurant were extremely helpful. They produced a gluten free page in their allergens menu and told me how to adapt the dish I wanted. 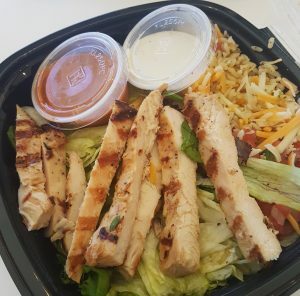 I had the chipotle chicken mex bowl, minus the tortilla strips.